Motekiai Langi is months away from joining the BYU football team, but the Tongan native has no idea what he's in for. PHOENIX — If Motekiai Langi's chair were able to emote, it would beg for mercy. It deserves a Congressional Medal of Honor, a Nobel Prize in Physics—anything for holding out over this hour-long lunch as Langi's posterior overflows from three sides of its metal frame. Though this Phoenix-area Red Robin has seen its fair share of overweight American carnivores, he's another classification altogether: the human equivalent of a genetically modified fruit, the sort of man one imagines living at the top of a beanstalk or north of Winterfell. 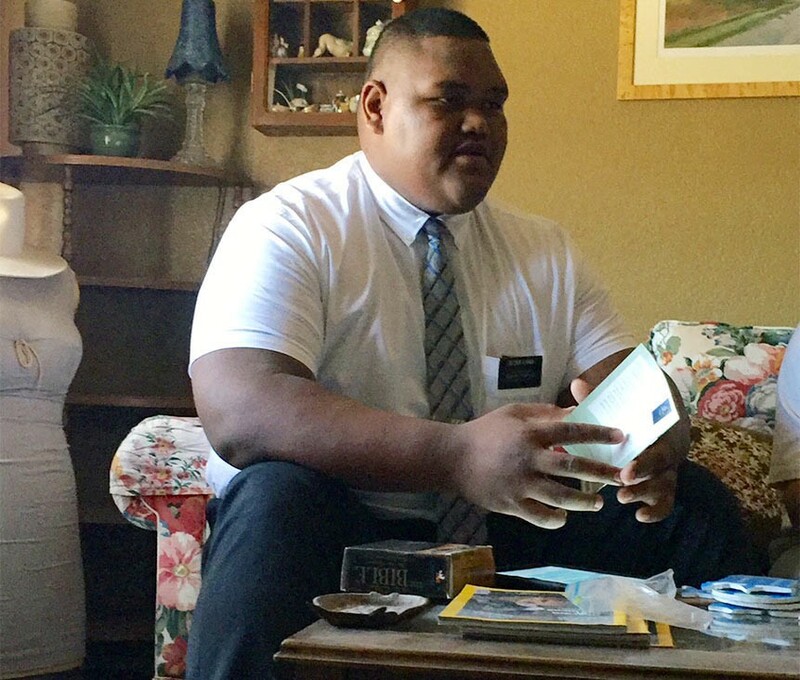 Standing 6'7" and weighing 425 pounds, Langi is dressed in the uniform of a Mormon missionary: white collared shirt, blue plaid tie, black pants and a nametag identifying him as "Elder Langi," which he goes by on these long days of proselytizing. He seems too big for the world around him; his 22-inch neck strains against his collar, his feet threaten to pop the seams of his size-15 loafers, and his hand makes the 766-calorie Prime Rib Dip it holds look like doll food. As Langi takes down his sandwich, a Euro 2016 soccer game between Austria and Hungary plays on the restaurant's televisions. At halftime, the broadcast shows footage of labor protests in Paris, but he barely blinks, having been unaware that the tournament was even taking place. France seems a world away from the blue-collar neighborhoods north of Phoenix where he's serving his mission, farther still from his native Tonga. Langi has never much been interested in televised sports, either, which is hardly noteworthy—except that he'll be playing one in a matter of months when he joins BYU's football team in 2017. On Feb. 4, 2015, BYU announced its recruiting class for the upcoming season. The list was typical, with a heavy presence of players from Utah and a bent toward Californians and Texans. But as the athletics department tweeted out each recruit's information, several of the program's communications staffers hatched a plan. One name, they figured, might go viral. They'd include a photo. That would rile up Twitter. And then, they decided, they'd wait a bit longer to send the next tweet. That name was Motekiai Taukolo Langi, a 6'7", 410-pound, zero-star lineman from Tonga. His profile alone would have been enough to garner notice, but in the photo accompanying it, Langi is a human snarl, the left side of his upper lip curled toward his nose, his brow not so much furrowed as it is an awning shading his deep-set eyes. He appears to be staring down the rest of the world, ready to clobber it. The communications staff was right. For a few hours, Langi was the Bigfoot of football Twitter. ESPN's sports business reporter and arbiter of Twitter tidbits, Darren Rovell, speculated that the whole thing might have been a hoax. 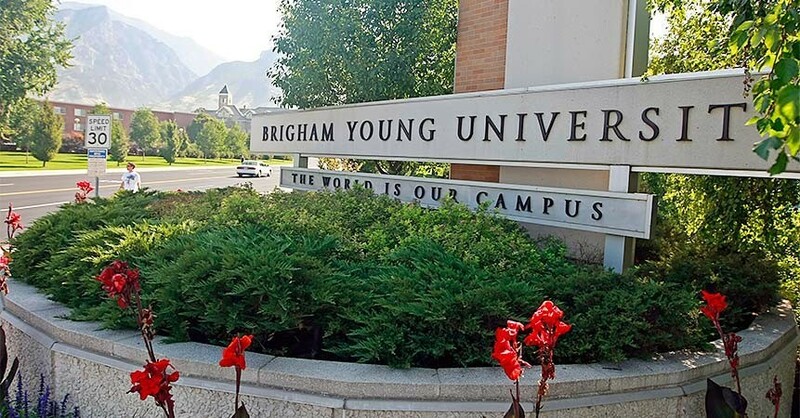 "Is BYU trolling us?" he wrote. "No video or pictures of him playing on the Internet. Four total photos on Facebook." Soon thereafter, BYU's football media relations director, Brett Pyne, tweeted a photo of Langi standing next to 6'7", 265-pound defensive end Bronson Kaufusi, who was a third-round pick in the 2016 NFL draft. The older player looked willowy in comparison. This was no hoax. That afternoon, then-BYU coach Bronco Mendenhall was giddy at the mention of his most obscure recruit. He revealed in his press conference that Langi had never before played football, and he hadn't offered him a scholarship until 10 days earlier, during what was supposed to be a meet-and-greet. "When I shook his hand," Mendenhall said that day, "[it] went almost up to my elbow." The coach joked that Langi could help BYU's team by doing as little as lying down at the line of scrimmage. He seemed as surprised as anyone that this kid had fallen into his lap, but really, Langi's journey to Provo was more nuanced than a stroke of good luck. It was a product of faith and of genetics, of relationships and the willingness to take a chance in a sport where poor risk-management can cost million-dollar coaches their jobs. The risk that is Motekiai Langi began as an email in the inbox of Steve Kaufusi, a BYU assistant, in 2013. It was from an acquaintance, Kelly Moore, the former coach at Mesa (Ariz.) High, and the gist of the message was simple: I found a giant. In Tonga. Take a look. Moore attached a photo, and Kaufusi, a native Tongan, added the kid to his list of players to visit on an upcoming trip. Meanwhile, Langi was a 17-year-old employee of a pig farm on Tongatapu, the largest of Tonga's 169 islands. He'd just finished a five-day football camp near his home, led by Moore and Mone Angilau, a former high school player, but Langi thought little of his performance. By then, the teenager weighed about 400 pounds, and despite a frame that would put most professional linemen to shame, he'd never touched a football before the camp. His learning curve that week was steep, to say nothing of the equipment issues he faced. With a head so large it didn't fit in a traditional high-school helmet, Langi was forced to share an oversized model with an American defensive lineman who'd come over for the camp. That dictated his position: He couldn't go helmetless, so offensive line it would be. "I was on the line, swaying around, and flags were flying," Langi recalls of the Friday game. "I figured, maybe I should just stay still." That, and pancaking smaller players, was the extent of what he gathered in a week he never imagined would change his life. At the time, Langi's post-graduation plan was set: He'd work on the farm until at least the following April, at which point he'd turn 18 and be eligible for the Mormon mission he'd been planning and saving for for years. He'd also spend time with his mother, Mele Langi, whom he calls his best friend; as the eldest of three siblings, he felt the responsibility to help her through the aftermath of his father's sudden death from a blood clot that same year. Langi's interest in football was nonexistent. The camp was a reprieve from wrangling pigs, and after his mission, he figured he'd study in New Zealand, perhaps, or work on a farm. In 999 dice rolls out of 1,000, that would have been his life, maybe average, probably happy, certainly expected—which is why he was initially so skeptical of Kaufusi's interest. The BYU coach arrived in Tonga after the 2013 college football season, and he watched Langi play a pickup basketball game with impressive dexterity for a player of his heft. When the two met, Kaufusi found a soft-spoken, intelligent teenager who'd maintained close to a 4.0 grade-point average at Tonga's most challenging high school. Still, the coach had reservations. "You're really taking a chance on this kid, I'm thinking, but he'd be one to take a chance on because of his mere size," Kaufusi says. "I didn't even know how much he weighed because we didn't have anything to weigh him on." During their conversation, Langi revealed to Kaufusi that he planned to go on a mission, but his initial departure had been pushed back from 2014 to January 2015. To the teenager, life beyond missionary work seemed an eternity away, and football might as well have been a sport played on the moon. Langi expected the coach's visit to come to nothing, and that was fine. June 14, 2016 begins like most other days for Langi and his mission companion, Elder Mason Shepherd: with a 5:30 a.m. wakeup call. The two get up earlier than others to get in more than the mandatory 30 minutes of physical activity in their apartment complex's gym; both are interested in staying—or getting—in shape. (Recently, the two men, who estimate they weigh a combined 650 pounds, visited Arrowhead Mall in Glendale. When they stepped on the escalator, they swear the thing slowed down.) Shepherd plans to walk onto Boise State's football team—underneath his layer of mission softness lurks an undersized defensive lineman—and BYU gave Langi a workout plan. His routine is simple: ride a stationary bike for 20 minutes and then lift. Next, the two spend the morning studying scriptures before driving their church-issued Nissan Rogue to the home of a family of six on a cookie-cutter cul-de-sac of stucco ranches. (Langi wouldn't be able to fit in most of the church's smaller, fuel-efficient models, so the two get an upgraded vehicle.) They're here to teach the husband a lesson about service work, which they do from the couple's overstuffed leather couch, with the help of an iPad and Apple TV. Through it all, Langi is a human jungle gym for two of the couple's four children; they throw plastic toy food at him, climb over him and tug on his pants leg as he talks about his faith. After the lesson, Langi stands near the passenger side of the car, his head and shoulders fully visible over its roof. Discussing lunch destinations, his face betrays nothing. "Would you believe I'm a vegetarian?" he asks, joking as only the sort of person who looks as if he might eat a vegetarian for his afternoon snack can joke. Tonga, which lies between New Zealand and Hawaii, is an island paradise with an obesity epidemic. Until the mid-20th century, Pacific Islanders had been fishermen, subsistence farmers and warriors for thousands of years. Genetically, their bodies had adapted to high-protein diets and learned to store fat more effectively after withstanding famines. That status quo lasted until about 50 years ago, when commercial fishing decimated the waters around the islands and left Tongans with a decision: Should they purchase the fish they'd been spearing for free for generations or look for a cheaper meat source? They chose the latter and turned to New Zealand, which had begun exporting a fatty cut of meat called lamb flap. Combine that shift in diet with an increasingly sedentary way of life and the traditional ideal that bigger means more beautiful, and people ballooned. Obesity rates in Tonga hover at about 50% of the population, among the highest in the world. Tongan culture also revolves around feasts, and those massive meals, another cause of obesity, are often tied to religion. The islands make up one of the world's most devout countries, with a sect of Methodism, the Free Wesleyan Church, and the LDS Church representing the most popular faiths. According to the LDS Church, 60% of Tongans identify as Mormons; however, census data states that membership stands at 18%. Regardless which figure is closer to the truth, Tonga is one of the world's most heavily LDS countries. On his father's side of the family, Langi is fifth-generation Mormon, and Tevita Langi was the youngest of 10 sons in a tight-knit family. (The background of Langi's church-issued iPad reads "Keep Calm, I'm a Langi.") In fact, the group is so close that word of Langi's brief and abstract recruitment made its way back to relatives in the U.S. At the time, his cousin Harvey Langi was set to transfer to BYU, and Harvey's mother, Kaiesita Langi, decided to take her nephew's future into her own hands, pressing him on a trip to Tonga to consider football. When he stayed with her family before departing on his mission, she resorted to more extreme persuasion: luring him into the car under the pretext of shopping and instead taking him to visit BYU's coaches. It was January 2015, just a few weeks before National Signing Day and only days before Langi was to report for instruction at the Missionary Training Center, which abuts BYU's campus. If Langi was going to have a future in football, he needed to make some kind of contact before his mission, Kaiesita thought, and so she took him to meet with Kaufusi and Mendenhall. Kaufusi spoke with Langi first, and though he believed the meeting with the head coach was nothing more than exploratory, he had one piece of advice for the younger Tongan: If you're offered a scholarship, accept it on the spot. "He's got to be able to do something," Kaufusi recalls Mendenhall telling him later. "I don't care if he even falls over and buries the defensive tackle. We've got to be able to get something out of him." 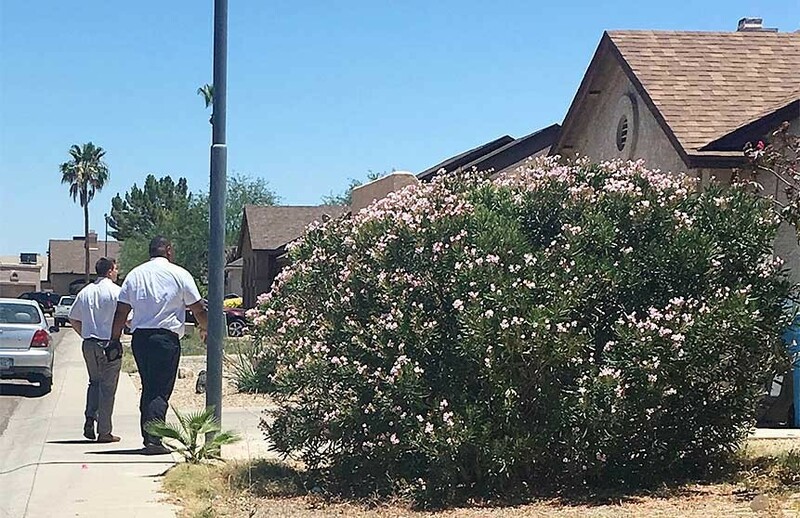 After lunch on this scorching June day, the temperature in Phoenix is ticking toward 100 degrees, and Langi's brow is dripping sweat after each fruitless walk from the car to a front door. He and Shepherd don't have to tract, the Mormon word for knocking on strangers' doors, for long, though; they have a 1:30 p.m. appointment with a woman who expressed interest in the faith the week before. The interior of the woman's stucco house is poorly lit and full of boxes and furniture upholstered in varying florals. She's in her mid-50s, red-haired and freckled from years of Arizona sun, and she takes care of her elderly mother and two dogs. Recently, she lost a dear friend to cancer, and she says she now has PTSD. She's a curious woman—her living room is littered with issues of National Geographic—and as Langi and Shepherd teach, she often interrupts to tell them about a documentary she just saw or a story she read. She isn't afraid to disagree, which ruffles Shepherd but leaves Langi unfazed. She's searching for something—companionship, answers, perhaps religion—and Langi connects not with her objections, but with the hardships she describes. When she brings up her deceased friend for the third time, Langi takes a moment before he responds. When he speaks, it's halting, and he pauses for breath after every word, almost choking for air. He cries a single tear as he tells her about his father, about how much he misses him, about where his faith says we go in the afterlife. The woman glances from Langi to her hands and back again. She's more affected by this than any other lesson the two 20-year-olds have taught. When they ask if she'd like to be baptized soon in a religion she's learned about for a matter of days, she says she thinks she would. Missionary work comes naturally to Langi. Between his brute strength and emotional intuition, he's almost perfectly suited to the job. He'll talk at length about service work and the blessings he's incurring, but the mere mention of football leaves him searching for words. When forced to confront the idea of playing on television, of scrutiny for something other than his spotless character, Langi laughs rather than offer any insight. To speculate about his talent is to set him off on a tangent about how BYU just needs an oversized water boy. Ask him which line he'll play on, and he's quick with the humor: "I'll be the sideline," he says. "Water boy, towel boy, shoe-shiner." He continues: "Water is important. I'll just tell them when they're not drinking water, 'When I was on my mission in Arizona, I learned that if you don't drink water, you will pass out.'" Langi's words are tinged with denial. He's spent less than a week of his life in Provo, and because he won't be discharged from his mission until the end of January 2017, he won't be able to enroll that winter semester for spring ball. Instead, he'll return to Tonga and will join the team that summer, almost a year from now. He won't play for another year after that. In his mind, he has months to contend with his change in uniform from ties to pads, but one aspect of what looms already nags him. When Langi left BYU's facilities after accepting his scholarship, Kaufusi shared a parting piece of advice: "Prove to us that you really want this," the coach said, "and the only way to do that is to drop weight." At the time, Langi weighed 410 pounds, but he'd filed his mission paperwork with the white-lie weight of 350, and BYU's coaches decided on that number as a target. In January, a year into Langi's mission, Kaufusi emailed. Langi responded a few days later, informing the coach that, well, his weight was up to 460 pounds. He'd been sedentary and busy—and the coach wanted none of his excuses. "What happened to what we talked about?" he wrote back. "You've shown me that you aren't very dedicated and committed through your actions." Kaufusi offered advice, too—drink water before every meal, eat "rabbit food" after 6 p.m.—but all Langi saw was the criticism. A few weeks later, he was dispatched to Cottonwood, Ariz., a rural town 100 miles north of Phoenix. There, he rode bikes—breaking five of them, he says, with his girth—and got his weight down to 419 pounds. That's when a video of him racing two other missionaries in the 40-yard dash at a Conoco gas station went viral on social media. (Langi won.) He was finally on the path to football shape, and he enjoyed his active way of life, which ended when he was sent back to Phoenix and his Nissan Rogue. But when the waitress at lunch offers him Red Robin's unlimited fries, he tells her no. For now, that's enough: fewer fried foods, an outmoded apartment-complex gym, those cobbled-together hours on the bike. Langi is lucky that he doesn't know how inadequate it all is, that he can't imagine the synchronized hum of 60 players in a state-of-the-art weight room or the protein shakes, lean meat and Muscle Milk that make up most of his teammates' diets. He's just a big man at a fast-food joint in a suburban strip mall, with a hectic schedule and limited funds and a Prime Rib Dip in his right hand. He's not a football player, not at all, not yet. And so when a companion tells the woman at his afternoon lesson that he's signed to play for BYU, Langi has no response for her excitement or for the stream of commentary it evokes. Her niece married a college football player, you see. Silence. She'll have to look him up online. Nothing. She can't believe he didn't say something sooner, she tells him, her voice tinged with disappointment. Langi smiles. In fact, he never said anything at all.